Red Wing is a historic little town, known for Red Wing shoes (Vasque) and Red Wing pottery. Located on the banks of the Mississippi River, this little town is surrounded by wooded bluffs. Barn Bluff is the most prominent and aptly named, as it resembles a giant barn rising from the south end of town. 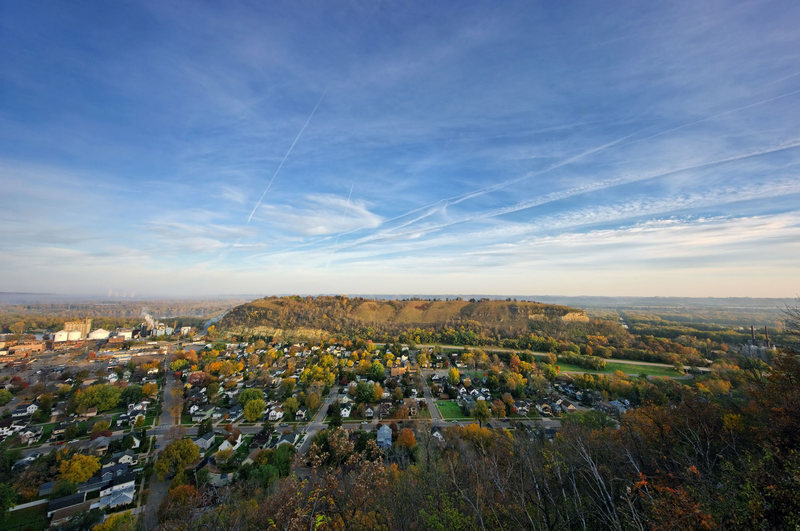 Barn Bluff (aka Mount LaGrange) in Red Wing is a short hour's drive from the twin cities of Minneapolis and St. Paul. Rising up approximately 350 feet, the bluff offers excellent views of the Mississippi River Valley. It also offers limestone climbing with over 100 single-pitch sport routes of varying difficulty from 5.4 to 5.14. While a few mixed and traditional routes exists, Barn Bluff is the primary sport climbing area in Minnesota. This 43-acre park was purchased by the city residents in 1910 and is managed by the city of Red Wing. Barn Bluff at sunrise. October 2010. There is an on going effort by the Minnesota Climbers Association (MCA) and numerous volunteers to assess, replace and maintain the anchors and bolts at Barn Bluff. Please help out in anyway you can by becoming a member of the MCA, donating money or volunteering your time helping with the rebolting efforts. Any help you are able to provide will be greatly appreciated. Along with this effort, the MCA and local climbers are asking climbers at Barn Bluff to use their own gear with top rope setups, especially on fixed anchor gear meant only for occational lowering. Assess the anchors setup, replace old and worn out carabiners, use your own gear for top rope setups and report questionable anchor setups. Please visit MCA's website and dreezman's bolt/anchor replacement effort web page for more information. Jim Blakely was exploring the old quarry on Sorin's Bluff in Red Wing when he spotted a steep cliff across the valley on Red Wing's famous landmark, Barn Bluff. Near the east end of the South wall was a crack that appeared to run uninterrupted from the ground up to the top of the fifty-foot cliff. Being accustomed to disappointing results from his exploration of S.E. Minnesota rock, Jim waited a week before he parked his car on the highway and hiked up to the rock. He discovered not only what appeared to be a great place to climb, but also that it was a city park with it's own parking area. He didn't have to park on the highway! Climbers were few in those days, and Jim would make trips to Barn Bluff whenever he could find a partner. On his first exploration of the bluff, he rappelled from an old piece of drill rod stuck in the rock at the top of the bluff. He planned to use several medium size trees on the steep shoulder of the cliff for top rope anchors over the crack that would soon be known as "Barnburner". One of the trees was girdled by a weathered piece of cotton rope equipped with a steel rappel ring. This is the only evidence found of climbing (rappelling?) at Red Wing before Jim Blakely began in 1975. Other climbers to visit Red wing in the late 70's were Bob Rossi, Dave Pagel, Rick Kolath, Tommy Deutschler, Mike Dahlberg, and a handful of Red Wing locals. During this time in the late 70's, Bob Rossi made what was probably the first lead of Barnburner crack. This is a very tough lead by today's standards, but imagine doing it without sticky shoes, no cams, and no anchor on top! Climbing at Barn Bluff in the early 80s was a lonely affair. Aside from a small group of Red Wing regulars from the Rochester area, the number of climbers that visited The Bluff could be counted on one hand. There were several locals from Red Wing that would climb at the bluff a few times each summer, mostly doing aid climbing in the cracks or bouldering traverses. Mike Dahlberg and Melissa Quiggley made frequent visits to the pocketed dolomite at Barn Bluff. Dahlberg completed some of the hardest leads at the bluff up to this time, including Jim Blakelys top rope test piece, Relentless, 5.11. Mike and Melissa also made the first forays onto the pocketed faces at Barn Bluff. Mike did Soft Touch, 5.12 at this time, never expecting the flake above the crux to last more than a year. Its still there, in 1999. He also placed several fixed pins and led the strenuous Relentless Direct Finish, 5.12. A lead of a route at the bluff in the 80s was a very serious affair. The problem was not with the rock failing to hold gear - it was topping out onto a sloping gravel pile with nothing for an anchor and nothing solid enough to hold gear. The only anchors to be found were a few scattered trees 60 to 80 feet up loose rocks held in place by wet grass. A typical evening of climbing at Red Wing started with a hike up the bluff with a pack full of ropes, gear, and webbing. Hundreds of feet of webbing! To hang Barnburner (a weekly favorite), you would rap from an old piece of 1 drill rod buried who-knows-how-deep into the rock at the top of the south end. Sixty feet below, anchors were engineered from small trees. These trees would provide anchors for Barnburner, the Prow, Barndance, Dead Dog Face, and Dead Dog Arête. The last one up the route had the responsibility of actually making it to the top, taking down the webbing & gear, and then rapping from rap rings tied to the largest tree. Another area that became popular for our top rope engineering was the SoftTouch  Jump Start area. We scrambled down to a small sturdy tree where we fastened a piece of 100 webbing. Using the webbing as a rap line, we slid down to another small tree 15 feet above the cliff line. This second tree and a piece in a crack at the top of the cliff completed our anchor. By changing the lengths of webbing on our anchors we could top-rope Soft Touch, Jump Start, and whats now called New Kids on the Rock. We always called it the arête to the right of Soft Touch. No imagination! Some of the trees that we used for anchors have since died and lost the battle with gravity. Relentless and Cooler Crack used to have nice anchor trees above them. Several dogs have also lost the battle with gravity at the Bluff. Mark Wehde and I belayed for several weeks next to a dead Gordon Setter that had fallen from the Prow. When its odor finally became more than we could stand, I tied a short piece of brown webbing to its leg and flung it into the woods below. Hence the names Dead Dog Face and Dead Dog Arête. Several years later I was climbing on a beautiful summer day that had attracted lots of hikers to the bluff. A father and son walked by, the boy twirling a bone on the end of a piece of weathered brown webbing! The other dog incident involved a small dog that fell off of the dark side while chasing a squirrel. His owner asked for our help in finding him in the heavy underbrush that covered the dark side at that time. He was still alive when we found him, but we doubted if he made it through the night as he was pretty busted up. When we returned to the Bluff in the spring after the winter of 89, we found that some of our favorite routes had bolts and anchors on them! We felt that our local crag had been violated. But after trying some of the new face climbs and seeing the potential for many more routes than we had been doing, we had to admit that the new bolts and anchors were an improvement. They added a new dimension to climbing at Red Wing and added a margin of safety by removing the need to travel up and down the steep and loose slopes above the cliff line to set up top-ropes. The rock at Red Wing that provides us with such nice climbing is Oneota Dolomite. Dolomite differs from limestone in that it has a greater amount of magnesium. Other characteristics common to Dolomite (or Dolomitic limestone) are solution pockets and chert nodules. We also see evidence of past groundwater activity in the form of quartz crystal-lined solution pockets, veins of silicates deposited from solution, and limonite (Hydrated Iron Oxide Hydroxide) transformed from staurolite (Iron Magnesium Zinc Aluminum Silicate Hydroxide) crystals. Evidence of past geologic activity can be seen in a fault visible from hwy 61. Because of this fault, the rock layers found at Barn Bluff are 150 feet lower than identical layers across the valley at Sorin's Bluff. This faulting may also contribute to the qualities that make the Barn Bluff Oneota Dolomite more suitable for climbing than the Oneota layer is in other locations. Dave Rone climbing Frequent Flatulence. Red fox that seems to love craisins. Hangin' out doing some climbing in January! you guys can start adding routes... just try to follow the current entries to be consistent. You do NOT want to camp at HayCreek! Its all strange old people in campers. We went this summer and were the ONLY tenters in the whole place. Everyone has a golfcart. Very strange, and expensive. Was climbing Sunday 3/28, beautiful day until someone started lobbing rocks from the top of the bluff. I'll be sporting a helmet constantly on my next trip. I was climbing at Barn Bluff last summer and noticed a vast array of maroon crystals within the surrounding rocks. Can anybody shed some light on what these crystals may be? Doesn't really seem like quartz crystal. Some of the number ratings are different in the new Mike Farris guidebook, it appears that they have been updated to accomidate route breakage, slickness, and a community consensus. I contributed a bunch of routes here a while ago, would be willing to re-number based on the updated guidebook, and/or the consensus rating on here. Anyone have an opinion? My partner was a ceramic artist-really nice tall guy who just returned from McKinley. He would be about late fifties? now. Anyone know of him?? Can't recall his name. We climbed at Devil's Lake too. Thanks for bringing back memories of tied-off crumbling roots and other sketchy shenanigans. Never thought this place would become popular, but that's what I thought about many other then-obscure areas. Ha Ha. Thanks for posting about Barn Bluff, maybe I'll visit again someday. In my opinion, the climbing here isn't even close to worthwhile. The routes were generally short and uninspiring. I chose Preemptive Strike, because it was the longest and most inviting. On my onsight attempt, I broke off a baseball-sized hold on the left side of an undercling just below where I assume is the crux. I promptly bailed, because I don't want to climb on choss and endanger my belayer. What's the local ethic on climbing after a rainfall? It rained last night, and when we showed up this morning, the ground was still damp around the base of the crag. There were some very obvious wet spots in a few areas, but the condition of rest of the wall seemed a little more ambiguous. Most of the rock looked dry to the touch, but had a coolness or silty quality to it. It was subtle, and knowing. that limestone absorbs water, and that Barn Bluff already has a big problem with choss, we decided to pack up our stuff and head out. We respectfully shared our concerns with the others we saw climbing there and those we met on our way down the approach trail.